In my family, there are a total of six iOS devices: A pair of iPhones and iPads for the wife and me, and another pair of iPads for the kiddos. That means we’re often scrambling to find AC adapters and spare outlets when it comes time to charge everything. 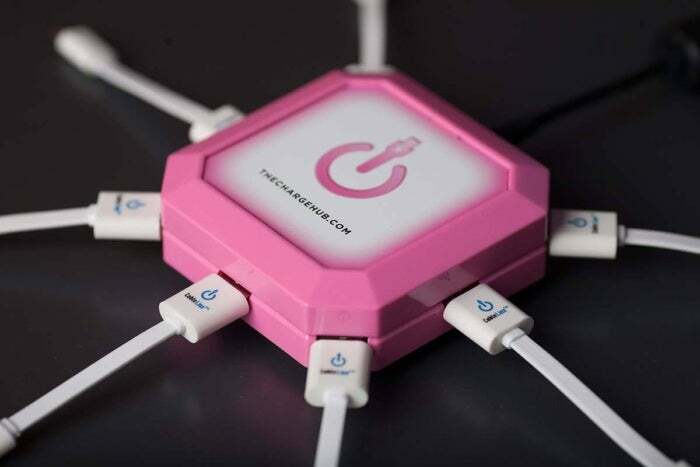 Enter ChargeHub, billed as “the power strip for the 21st century,” a bold claim that’s more than marketing hype. After all, for most smartphone and tablet users, it doesn’t make sense to use wall outlets and traditional power strips with bulky AC adapters when a few simple USB cables get the job done. That’s exactly what this is: An inch and a half tall, 3.5-inch round polycarbonate puck that provides multiple USB ports from a single AC outlet. Weighing only half a pound, the charger accepts dual voltage 110-240V input, making it compact enough for international travel. ChargeHub is available in three models, distinguished by the number of ports and how much power they output. The three-port, 25-watt X3 ($39.99 MSRP; $30 on Amazon) and the five-port, 40-watt X5 ($50; available on Amazon), but there’s also a seven-port, 44-watt X7 ($60; available on Amazon). The six-foot, two-prong AC cable at the back of the unit is detachable, and conveniently includes a Velcro strap to reduce the amount of excess cables. That doesn’t help when plugging in multiple devices with stock Lightning cables, but the company sells 3.5-inch flat cables designed for this purpose; unfortunately, none are included with the X3 or X5, but a pack of four sells for $24. 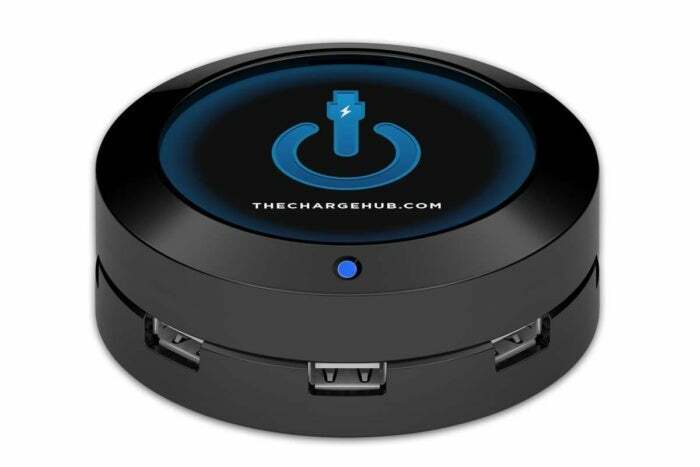 Weighing half a pound, the puck-shaped ChargeHub X5 offers enough power for up to five USB devices at once. 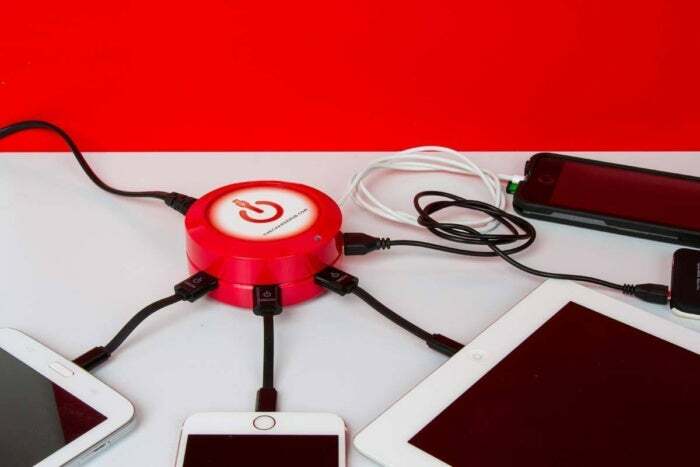 ChargeHub makes up for that stinginess by offering the ability to customize. Each model is available in your choice of eight colors: Black, white, red, blue, pink, purple, orange or green. (X7 is also available in clear, or with a square design.) But the customization doesn’t stop there. Users are encouraged to swap out the company’s logo on the top with one of your own, courtesy of a web-based Design Studio. Here you can add photos (your own or from a large image gallery), add text, and export a PDF file to print at home. It’s a fairly basic, Adobe Flash-powered affair, but gets the job done. Otherwise, ChargeHub delivers where it counts. Each port is capable of pushing a maximum of 2.4A for the fastest charging speeds currently available with iOS devices. The hardware is solid and well-built, and I liked the rubberized ring around the bottom that keeps the unit from sliding around on a kitchen counter. Although X3 and X5 get the job done, I’d recommend investing extra money into the X7 instead. Not only does it offer a slick adjustable blue LED that lights up on the bottom, but you can accessorize the external 48W power supply with an optional international travel kit or swap for a 12V vehicle charger ($20) instead. 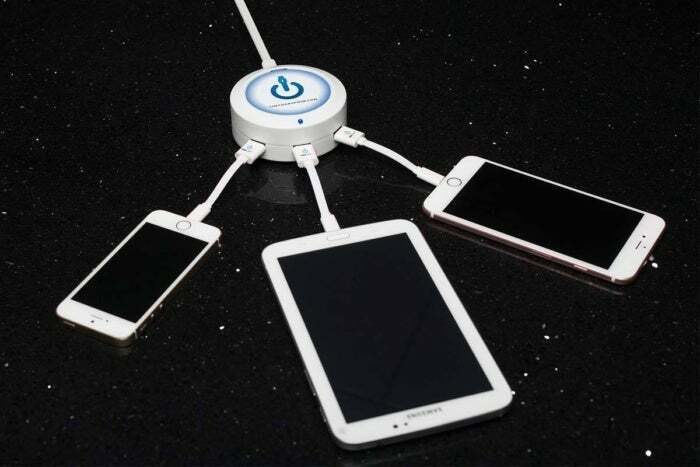 The 7-port ChangeHub X7 is available in a round or square form. ChargeHub X3 and X5 are a great for charging multiple USB devices at once, but the X7 winds up being more versatile for only a few bucks more.